Build reviews into your process. Perhaps the single best advice for businesses looking to improve reviews is to put them on auto-pilot. 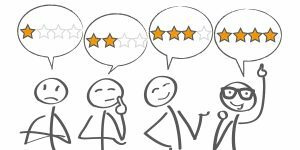 Systematically asking for reviews with each transaction helps you learn more about your audience, and your team’s performance, good or bad. Timing is important in building a bank of positive reviews. For example, a mortgage lender we know automatically sends a satisfaction survey at the closing of each loan, when clients are excited about moving into their new homes. They also make it a practice to turn compliments into referrals. Staff members are trained so that at the moment they receive a compliment, they ask the client if they have friends or family who may also need financing. Strive for visual impact and personalization. A positive review in print is good. One with a client’s full name, photo and some additional information such as a job title or background is better. A video review featuring a client talking about your business packs a powerful emotional appeal. Any response to is better than no response. In fact, a business owner apologizing to a client online and describing the steps taken to make the situation right can build credibility and leave prospects with a favorable impression. State the facts. Likewise, don’t let online misstatements about your business or unfounded criticism go unanswered. You don’t want an argument, but it’s a good opportunity for you to explain the situation and politely set the record straight. Stick to the facts, even if your reviewer does not. Empathy counts. Remember, you can still acknowledge your client’s concern and disappointment even if the issue was not your fault. Sometimes, just by listening and letting people vent their frustrations, you can turn the situation around and salvage a relationship that could lead to future business. Comments? If you’ve got questions or your own tips concerning online reviews, please share in the comments below!